Putting together a mock draft before the Senior Bowl lends itself to potential pitfalls and miscues. Between now and even the end of the week, this mock draft will undoubtedly change as players will turn heads in both practices and Saturday’s game, and there will be much banter with scouts, coaches and general managers on site that will help shape some of the thinking moving forward. But for fans of 30 teams this week, it’s not about Arizona, the Lombardi Trophy or anything Super Bowl related. It’s all about the NFL Draft. With several more to come between now and draft weekend, here’s my first mock draft of 2015. Obviously, free agency, coaching hires and offensive and defensive scheme decisions will help shape and mold this as we move toward April 30. But for now? Consider this the blueprint. Dig in. Don’t agree? Let me hear about it. Tweet me at @PSchrags or email me at PeterSchrager@gmail.com. 1. Tampa Bay Buccaneers: Jameis Winston, QB, Florida State: I may be on an island with this one, but as of Jan. 20, I think Winston goes before Marcus Mariota and is taken first overall by the Bucs. This, of course, comes with a giant asterisk. That asterisk being that the Buccaneers — who I assure you have already begun their work on this — believe Winston checks out off the field. Tampa will employ a staff of individuals dedicated to this effort, will meet with Winston multiple times and will likely interview everyone heavily involved in the young man’s life. Why Winston over Mariota? Winston’s game translates directly to the NFL, as he excelled in Jimbo Fisher’s pro-style offense, while Mariota’s is still a relative unknown in such a formation. Sources from multiple NFL organizations have expressed concerns about the offense Mariota starred in at Oregon. Furthermore, Winston is a star in the state of Florida and specifically Tampa Bay, where there’s a large contingent of Florida State fans who cheered him on in college. As I pointed out last week on Twitter and on FOX Sports 1’s "America’s Pregame," Tampa Bay’s offensive coordinator, Dirk Koetter, had Mariota’s college coach, Mark Helfrich, as an assistant on his staff in the college ranks for eight years. Koetter will have a voice on this, but I think it’s a Lovie Smith/Jason Licht call. Licht is a lifetime scout who’s often credited for late-round steals like Trent Cole and Brent Celek in Philadelphia. He’ll do the work here. And in the end, I think it’s Winston. 2. Tennessee Titans: Leonard Williams, DT, USC: Pass on Mariota? Believe it or not, the Titans really liked what they saw out of Zach Mettenberger last year. A sixth-round pick in 2014, he wasn’t the reason the Titans went 0-6 in the games he started. He has a stronger arm than either Mariota or Winston, and I just don’t see Ken Whisenhunt scrapping his entire offense to build around Mariota, who’d be coming from a college offense. So, they shock the world, go with my top-rated player in the entire draft and build from the inside out. Williams is a 6-5, 300-pound defensive lineman who can rush the passer and stuff the run. There’s a minor red flag because of an offseason shoulder surgery, but that shouldn’t be too worrisome. Williams played through a torn labrum last season and battled an ankle injury this year and still was the most dominant player on the field. A hot shot high school recruit out of Florida, Williams has drawn comparisons to Gerald McCoy for his inside play and Muhammad Wilkerson at the end spot. 3. Jacksonville Jaguars: Randy Gregory, DE/OLB, Nebraska: The Jaguars loaded up on offense in last year’s draft, getting a franchise quarterback in Blake Bortles and picking up wide receivers Allen Robinson and Marqise Lee in the first two days. This year? I’d expect Jacksonville to use some of its free-agent money on a receiver (Dez Bryant, Jeremy Maclin, Randall Cobb, Demaryius Thomas, Torrey Smith and Michael Crabtree could be available) and get a defensive stud in the draft. Gus Bradley is a defensive coach at heart, and the allure of grabbing Gregory — a 6-foot-6, 250-pound pass rusher — may have Jacksonville sprinting to get their card in on draft day. Gregory can get to the quarterback but is also able to play a bit in coverage. This is a gem. 4. Oakland Raiders: Amari Cooper, WR, Alabama: Jack Del Rio is a defensive-minded coach, and the Raiders have gone defense in the first round the past two years, but Oakland should snag Cooper as Derek Carr’s long-term batterymate if he’s on the board at fourth overall. Compared favorably to Jeremy Maclin and Roddy White, Cooper is not a skyscraper like Calvin Johnson or a burner like T.Y. Hilton. He’s a 6-1, 215-pound No. 1 receiver with hands, strength and speed. At this stage in the game, scouts liked Sammy Watkins and Mike Evans both a bit more last year, but Cooper could go as high as two or three in this draft. Oakland is a good fit. Tom Brady isn't the only NFL star with a famous ex. Here are our other favorite relationships that reached the 'end' zone. 5. Washington Redskins: Landon Collins, S, Alabama: The Redskins defensive backfield was injured, inexperienced and at times embarrassing down the stretch last season. There was little position coach Raheem Morris could do with the unit come December, when it was 35-year-old Ryan Clark alongside a bunch of kids. Collins is my top-rated defensive back in this draft and can play either the free or strong safety spots in the pros. A 6-foot, 220-pound force in the middle, he’s that center fielder the Redskins defense has so sorely missed in the back end. Alabama defensive backs have been a mixed bag in recent years, but Collins is a can’t-miss. 6. New York Jets: Marcus Mariota, QB, Oregon: The waiting game ends for Mariota at No. 6. The theory that defensive-minded first-year head coaches don’t tend to like quarterbacks in the first round is just wrong. John Harbaugh (defense/special teams) took Joe Flacco with his first pick, Rex Ryan (defense) traded up for Mark Sanchez, and Mike Smith (defense) grabbed Matt Ryan. Todd Bowles may be an expert on D, but the Jets go for the big splash with Mariota. This is a polite and mild-mannered kid, and there will be questions as to whether he’ll be devoured by the New York media, but I think he’ll be fine on that end. 7. Chicago Bears: La’el Collins, OT, LSU: With a new front office and coaching staff, I’m not 100 percent certain Jay Cutler will be the quarterback come Week 1 next season. Let’s assume he is. If that’s the case, I’d think Chicago would look to protect him. The Bears defense was an eyesore in 2014, but the pass protection wasn’t much better. Chicago struck gold a few years back with Kyle Long in the first round. Add Collins to the line, and there’s another five-star talent setting up the offense for success. A four-year starter at LSU, Collins can play right away. His build and surprisingly nifty foot speed gives him the edge over a few others in a strong offensive tackle class. 8. Atlanta Falcons: Alvin "Bud" Dupree, DE/OLB, Kentucky: The pass rush was invisible, yet again, for the Falcons in 2014. The defense — which was hyped as rebuilt and rejuvenated after big free-agent money was spent on Paul Soliai and Tyson Jackson — was poor. I had Khalil Mack pegged as a top-five pick the second I saw him destroy Ohio State (and now Colts) offensive tackle Jack Mewhort last September. Back in October, I tweeted that Dupree was going in the top 10. That could, of course, change between now and the draft, but the local boy from Irwinton, Ga., is a 6-4, 270-pounder who has put on 15 pounds over the last few years and is ready for the next level. Teams don’t take a pass rusher in the top 10 unless he’s an awfully special talent. I believe Dupree is just that. 9. New York Giants: DeVante Parker, WR, Louisville: Could the Giants really take another wide receiver in the first round? Why not? The offense was really starting to click under Ben McAdoo in the final weeks of the season, and we saw what worked best for McAdoo in Green Bay: a plethora of options for his quarterback. The Giants have needs on the offensive line and in the defensive backfield, but general manager Jerry Reese tends to take playmakers with his first-round picks. Parker is electric, has better size than Amari Cooper and could have been a Day 2 pick in 2014. This may shock the world, but adding Parker to a wide receiver crop that includes Odell Beckham Jr., Reuben Randle and a seemingly healthy Victor Cruz could put Eli Manning in position for another playoff run in 2015. 10. St. Louis Rams: Andrus Peat, OT, Stanford: Nothing flashy from the Rams; just another offensive lineman who could help protect a (hopefully) rehabilitated Sam Bradford. Greg Robinson was forced into the tackle spot a season ago and played admirably. With Peat in the mix, Robinson could either move back to guard or man the other end. If Marcus Mariota slips to 10 — which I think is possible — St. Louis will have to think long and hard about choosing him. 11. Minnesota Vikings: Brandon Scherff, OT, Iowa: The future is bright in Minnesota, as Teddy Bridgewater and Anthony Barr both appeared to be home run selections in the first round a year ago. There are issues on the offensive line, and a rash of injuries didn’t help. Adding Scherff, a big boy with a mean streak who’d fit in wonderfully in NFC North cold-weather environments, would be a solid, though not flashy, move. 12. Cleveland Browns: Dante Fowler Jr., OLB, Florida: I’m a big Fowler Jr. fan and think he’d be a good fit in an already solid Cleveland defense. Karlos Dansby, Paul Kruger and Barkevious Mingo aren’t going anywhere, and Fowler Jr. could end up being the best of the bunch at the next level. A roving front-seven guy who could line up either on the line or at linebacker, Fowler was a big-time performer who excelled on a bad Florida team the past few years. Mike Pettine likes tough guys who bring it on every down, and that’s Fowler Jr. Good fit here. 13. New Orleans Saints: Vic Beasley, DE, Clemson: The Saints roster will change dramatically this offseason due to the highest salary cap number in the league and a host of veterans set to make north of $10 million next year. All things being equal, they could use another pass rusher off the edge. The pass rush wasn’t what it was in 2013, and after Cam Jordan and Junior Gallette, the cupboard was awfully bare last season. Beasley was the ACC Defensive Player of the Year in 2014 and possesses an electric first step. I’ve had scouts rave to me about him as a pro prospect. Good fit in Rob Ryan’s 3-4. 14. Miami Dolphins: Shaq Thompson, LB, Washington: Thompson will be a first-round pick. The question is just where he’ll go in that first round. He could be a top 10 selection or a bottom-third guy. I think a good landing spot is Miami, where the 6-foot-2, 230-pound defensive playmaker could join a promising young defense already on the upswing. Thompson looks like a safety at times because of his playmaking ability and size, but so does Lavante David, and he’s a perennial All-Pro consideration in Tampa. 15. San Francisco 49ers: Kevin White, WR, West Virginia: Some folks around the league like White more than Parker, and a few believe he could be even better than Cooper. I dig him, too, though he is a bit of a one-year wonder. A 6-3 junior college transfer with good NFL speed, he ended the season with 109 catches for 1,457 yards and 10 touchdowns in 2014. A big target with athletic features, White could be a key cog in the Jim Tomsula era. -The top 16 signal-callers of all time. 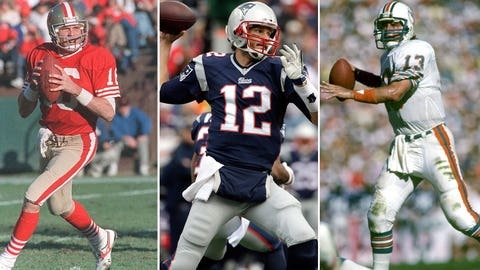 -FAN VOTE: Who is the best QB ever? 16. Houston Texans: Danny Shelton, DT, Washington: The Houston Texans got next to nothing from their first- and third-round picks — Jadeveon Clowney and Louis Nix III — a season ago and still won nine games. Adding another big boy, a defensive tackle like Shelton, would help against the run and give J.J. Watt a chance to do his thing on the outside with even greater success. I’d expect Clowney and Nix to be back in the lineup next year, but regardless of their health Shelton is viewed as a first-round defensive tackle prospect and could rise into the top 10 with a big Senior Bowl performance this week. A high school state champion shot putter, Shelton is a gifted athlete who could be this year’s Dontari Poe, rocketing up everyone’s boards. 17. San Diego Chargers: Shane Ray, OLB, Missouri: There are few athletes in this draft like Ray. Scouts say he can run a 4.4 40-yard dash, and at 6-foot-3, 250 pounds, he has the right size to play the outside spot in a John Pagano defense. He had 14.5 sacks last season in the SEC, where offensive lines are loaded with pro talent. Great snag for San Diego at 17. 18. Kansas City Chiefs: Jaelen Strong, WR, Arizona State: You know the statistic. You have heard it a million times. Alex Smith didn’t complete a touchdown pass to a receiver in 2014. Part of that was the way the offense operated, but part of it was on the wideouts. So Andy Reid and John Dorsey go out and get themselves one. At 6-3, 220, Strong has the physical build and the hands. I’m told he’s still a little raw, but that the potential is limitless. 19. Cleveland Browns (from Buffalo): Devin Smith, WR, Ohio State: The run on wideouts continues as the Browns find some insurance in case Josh Gordon’s future with the team goes awry. They love what they have in Andrew Hawkins and got production out of undrafted rookie Taylor Gabriel, but Smith — a local talent — could be a star. An NFL scout told me that Smith’s performance in Ohio State’s final three games was even more impressive than the show put on by celebrated quarterback Cardale Jones. A 6-foot-1, 200-pound specimen, Smith isn’t listed as a first-round pick in many of the mock drafts I’ve seen thus far. That doesn’t add up with what I’m hearing. 20. Philadelphia Eagles: Trae Waynes, CB, Michigan State: With his first pick as the man running the draft for Philadelphia, you might expect coach Chip Kelly to do something eccentric or outside the box. I think he does what’s best for his team and gets a starting cornerback. Waynes was a favorite of NFL scouts all year and should be a no-brainer top-20 selection. 21. Cincinnati Bengals: Dorial Green-Beckham, WR, Oklahoma: DGB could be the biggest wild card in the draft. Great potential on the field, red flags galore off of it. Cincinnati lacked the depth at receiver late in the season to compete with the Colts when A.J. Green went down with a concussion in the wild-card round. Marvin Jones should be back and healthy next season, but DGB could be the guy at 21. 22. Pittsburgh Steelers: Eddie Goldman, DT, Florida State: Goldman is a 6-3 physical specimen who looks a lot quicker on his feet than a typical 320-pound man. The Steelers could see a bit of turnover coming on the defensive side of the ball, and I wouldn’t be shocked to see them load up on younger talent this offseason. Goldman isn’t a sack machine, but he’s a run stuffer who can get to the quarterback as a 3-4 end. 23. Detroit Lions: Mario Edwards, Jr., DE, Florida State: Back to back Seminoles. The Lions could be looking to fill two spots at defensive tackle in April, with both Ndamukong Suh and Nick Fairley expected to hit free agency in March. I can’t see the Lions letting Suh sign anywhere else after his 2014 season — pay him whatever he wants! — and regardless of whether he is there, I like the thought of Edwards on that defensive line. A 6-foot-3, 295-pound defensive end, Edwards can get to the quarterback off the edge. He’ll shed weight and can fly. 24. Arizona Cardinals: Melvin Gordon, RB, Wisconsin: The Cardinals finished 31st in the league in rushing yards in 2014. Bruce Arians is well aware that the offense hit the skids down the stretch and needed a few more playmakers. No running back was taken in the first round in either of the last two drafts, but I can’t see Gordon — a potential Jamaal Charles clone — slipping past Arizona at 24. Multiple scouts have told me that they have Gordon listed as a first-rounder — the ultimate compliment for a player at his position. 25. Carolina Panthers: T.J. Clemmings, OT, Pittsburgh: Clemmings might be the most athletic tackle in this draft class. The 6-foot-5, 310-pound tackle isn’t a road paver, per se, but he has great footwork and fluidity. He needs some work on the technical aspects of the game, but can contribute during his rookie season. Carolina’s offensive line was a mess before hitting its stride in the season’s final month. The unit could use a top-flight talent like Cummings. 26. Baltimore Ravens: Arik Armstead, DE, Oregon: The Ravens could have an interesting offseason, with several veteran performers set to hit free agency. Armstead is an intriguing prospect because of his versatility. Often compared to Cardinals star Calais Campbell, Armstead can play either the 3-technique or the 5-technique and performed at a high level for a great Oregon team. At 6-foot-8, 290 pounds, the sky is the limit for Armstead with good coaching. He’ll find that in Baltimore. 27. Dallas Cowboys: Benardrick McKinney, LB, Mississippi State: With the impact we’ve seen in recent years from C.J. Mosley and Luke Kuechly, any stigma around selecting an inside linebacker in the first round should be erased. The Dallas defense could need defensive back help more than at linebacker, but if McKinney slips to 27, I’ll be shocked if the Cowboys let him pass on by. Sean Lee will be back next season, and Dallas got solid production from his replacements this year, but McKinney is a potential 10-year starter in the league, too. A 6-5, 250-pound tackling machine could be a good fit. 28. Denver Broncos: Nate Orchard, DE, Utah: Denver is another team with big questions in free agency. Regardless of what happens there and what defense the Broncos run, an additional young pass rusher could not hurt. Orchard is a gamer. He got to Utah as a receiver, put on the necessary muscle and weight and became one of the nation’s top pass rushers the past two seasons. He’s not an overly physical player, but he has a good instinct and ability to get to the quarterback. 29. Indianapolis Colts: Marcus Peters, CB, Washington: Vontae Davis and Greg Toler were arguably the best cornerback duo during the regular season, though they didn’t get nearly the national recognition as the combos in New England and Seattle received. 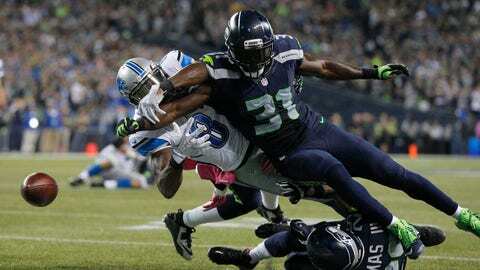 Peters would be a nice addition to an already good defensive backfield. Skill-wise, Peters could be the top corner in this draft. But there are some red flags, as he was dismissed from the team after arguing with assistant coaches in November. Some teams may shy away from that; others will like the edge. He’s a first-round pick. 30. Green Bay Packers: Jake Fisher, OT/OG, Oregon: Fisher’s absence from the Oregon lineup was felt during the regular season, and he performed extremely well against good Ohio State and Florida State defensive lines in the College Football Playoff. He can play on the left side, which will help come draft time. Fisher is a tough guy, and at 6-6, 300, I could see him fitting in with one of the tightest offensive lines in the league. 31. New England Patriots: Hau’oli Kikaha, DE, Washington: A pure edge pass rusher, Kikaha had 15.5 sacks and shattered Washington pass rushing records in his time at Washington. He missed nearly two seasons due to ACL tears, but injuries haven’t scared Bill Belichick in the past (see Dominique Easley). The medical examinations will be huge. If he checks out, he’s a first rounder. 32. Seattle Seahawks: Nelson Agholor, WR, USC: Pete Carroll dips into the USC cookie jar and gets the latest star wideout from his old school. Agholor gave up the opportunity to put up huge numbers with Cody Kessler next season to enter the draft, and it’ll be worth it if he ends up in Seattle with Russell Wilson. Agholor caught 104 balls and had 12 touchdowns last season. His game is fairly polished. I like him in the late first or early second round come April.